Max Disposti, founder of the North County LGBT Coalition, has a dream for a center to serve the Queer community in Oceanside the way the LGBT Community Center in Hillcrest serves the city of San Diego. His group is hosting a fundraiser Friday, May 20, 6 to 9 p.m. at the Oceanside Museum of Art, 704 Pier View Way in Oceanside to raise money for the Center ? and, as a gesture of community support, the San Diego Alliance for Marriage Equality is hosting one for the same cause the same day ? Friday, May 20 ? from 7 to 9 p.m. at the Bamboo Lounge, 1475 University Ave. (between Herbert and Normal Streets) in Hillcrest. PHOTO: Max Disposti (right) with his husband, Robert Waters, © 2011 by Xena Warrior. Max Disposti has a dream. He’s been dreaming since he moved from his native Italy to the U.S. in 1998 and came from the relative Queer haven of San Francisco to San Diego’s North County in 2002. It was love that brought him here; he met his husband, Robert Waters, in 2001, and since Waters had family in southern California the two decided to relocate. He’s also been active in various community causes — “not only in the LGBT [Queer] community but also other social-justice issues” — since he still lived in Italy, and his issue agenda, “social justice, immigration reform, opposing the death penalty, helping the homeless and people less fortunate,” is not one usually associated with the conservative stereotype of North County. 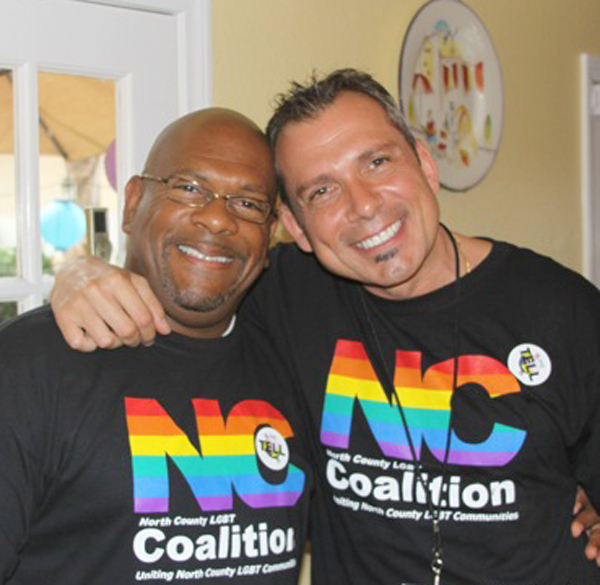 It was to bring the community groups together and to increase the visibility of Queers and Queer activism in North County that Disposti and others formed the North County LGBT Coalition in 2007. The campaign was kicked into high gear by the Proposition 8 campaign —and in particular the high public presence of the Yes on 8 forces in North County. “People realized there was a need for leadership” to take on the radical Right and to create a safe climate for North County Queers — especially young people still struggling with their sexuality — Disposti noted. “I truly believe that we need to be represented everywhere, and to educate people that our families are just like everyone else’s,” he said. “We have been very successful in bringing the different [community] groups together. Last week we had a public event and put together a panel of representatives of eight supportive churches, and drew 50 to 60 people” — itself a challenge to a stereotype that showed the religious community is not monolithically opposed to Queers and Queer rights. And now Disposti is working on making his biggest dream of all come true: the establishment of an LGBT Community Center in Oceanside to represent North County. He points out that the Center in San Diego is now one of the largest and best-respected organizations not only in the Queer community but the overall social-service community as well — but it wasn’t always that way. They had to build slowly, and so will the North County group. Nonetheless, he expects to find a location for his Center by the end of this year. And for those who can’t make it up to Oceanside, the San Diego Alliance for Marriage Equality (S.A.M.E.) is making their own Harvey Milk Day celebration a fundraiser for the North County LGBT Center. Their event takes place the same day — Friday, May 20 — from 7 to 9 p.m. at the Bamboo Lounge, 1475 University Avenue (between Herbert and Normal Streets) in Hillcrest. The event will feature a video on the Equality 9, the S.A.M.E. members who were arrested last August in an act of civil disobedience at the San Diego County Administrative Center, as well as a presentation (either live or on film) about the North County Center project. There will be no cover charge, but a portion of all food and drink sales at the Bamboo Lounge that night will go to the North County LGBT Coalition to help fund the Center. Long-term, Disposti added, “the challenge is not so much financial as to convince our elected officials that this is needed and that we’re creating a space where everyone feels safe to go. The money is one aspect. If you have the will, you can raise the money.” He also stressed that the Center will be an all-volunteer organization, and the only costs will be for rent and operating expenses.